Eighty-nine unique beers of fancy flavours and fun descriptions once again delighted and surprised drinkers at the Great Australasian Beer SpecTAPular this year. With a mix of both traditional and creative new brews on offer, and a chorus of praise for the event from attendees, the annual festival continues to stake its claim as Australia’s premier showcase of modern artisan brewing and beer diversity. Last month around 11,000 people attended the third Great Australasian Beer SpecTAPular (GABS). It was held across three days on the last weekend in May and, as was the case last year, the Saturday sessions again proved to be the most popular. More than a hundred different beers in total where available at GABS, when including those also pouring from the brewers’ stalls of the Beer Market. However, it was the creative and diverse festival brews that primarily attracted the crowds of excited drinkers. You only need to look at results from the People’s Choice voting to discover the flavour found in the diverse and crafty brews at GABS. The winner was a White Chocolate Raspberry Pilsner from Bacchus Brewing, followed by Feral’s Barrique O Karma, 2 Brothers’ The Magic Pudding, Garage Project’s Death from Above, Bridge Road Brewers’ Hop to it Honey and Two Birds’ Taco beer. 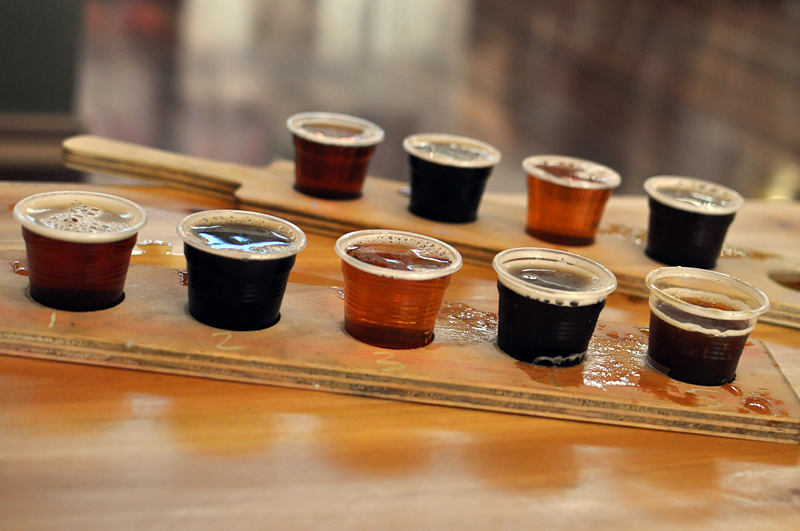 Each of these beers provided an interesting flavour twist, providing distinctive beer tasting experiences. Craft beer festivals are in vogue at the moment, especially in Victoria where there are now at least five annual large scale beer events on the calendar. The expo industry has been quick to join the parade, shaping the format and accessories on this emerging festival circuit. GABS leads the way with its focus firmly set on providing unique beer experiences through a showcase of brewing creativity and diversity. In 2011 GABS began as a mini-festival of Australian craft brewing, held over a single afternoon at The Local Taphouse in St Kilda. Last year it grew significantly through a move to Melbourne’s Royal Exhibition Building in Carlton. The move would help satisfy a long held desire of the GABS founders, Steve Jeffares and Guy Greenstone, to bring a large-scale German beer hall style venue to Melbourne. “I had wanted to create a beer hall festival for some time, in fact Guy and I had come very close to having an amazing venue in the city to open a full time beer hall for about 800-900 people,” Steve told Australian Brews News after last year’s GABS. 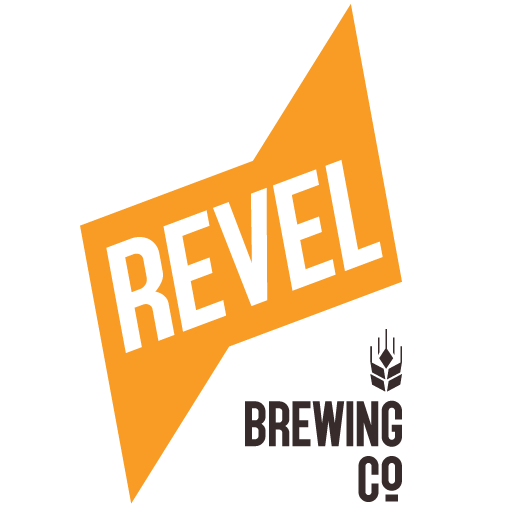 The expansion also allowed for the inclusion of our brewing neighbours from New Zealand. A global era for GABS began in 2013 with the inclusion of ten brewers from beyond Australia and New Zealand (including the collaboration between Victoria’s Moon Dog and Norway’s Nøgne Ø’s). The internationals featured names that are already familiar in Australia, such as Sierra Nevada and Brooklyn Brewery, as well as new arrivals to our shores from the likes of the UK’s Summer Wine and Camden Town breweries. 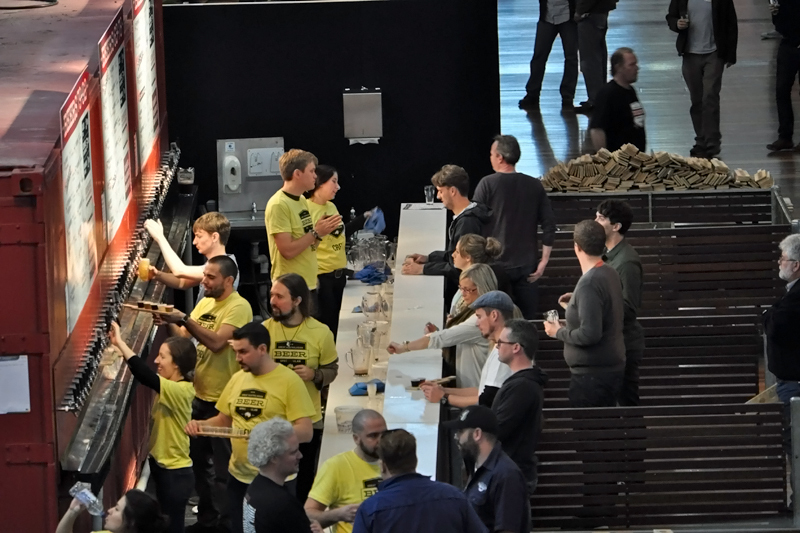 On entering GABS this year, it was quickly evident that the lessons and feedback from last year’s event had a significant impact on this year’s incarnation. Vast improvements to the layout and serving process for the bars pouring festival beers displayed a great deal of considered reworking by the organisers over the last twelve months. Last year, single queues fed the four bars, with each pouring every beer, then cashiers took payment as you exited the bar. This year, each bar now had an allotted sequence of festival beers, along with a direct walk-up interface with volunteers who both poured beers and collected tokens for payment. The new process negated the long delays of queue experienced last year and made filling up on beer a much more easy and pleasant experience. Two straightforward options were available for tasting beers – one token for 85ml samples or three tokens for a full glass using the 285ml festival glass that you received on entry. An abundance of tasting paddles made easy work of collecting and carrying five samples of your selection from the bar. With an average alcohol content of 6.1% across the festival beers, there was a spread across both light and heavy beers with no one style dominating. Highly visible roaming token sellers made purchasing more tokens as easy as raising of your hand to hail them from your seat, and resulted in no queues at the from the token stalls. The result was an uncomplicated and relaxed drinking experience. There was no shortage of ways to fill your time. Bands provided live music from a central stage; games such as giant versions of checkers, Jenga and Connect Four provided fun distractions from an occasional overload of hops; and a wide selection of gourmet food that paired well with the beer consumption catered for a tasty lunch, dinner or snack. But who had time for that? The crowd’s focus was clearly transfixed on tasting the unique festival beers. The Beer Market also proved a welcome addition this year, giving drinkers a chance to chat with the people behind the beers whist enjoying their regular product range, in contrast to the often crazy concoctions of the festival beers. 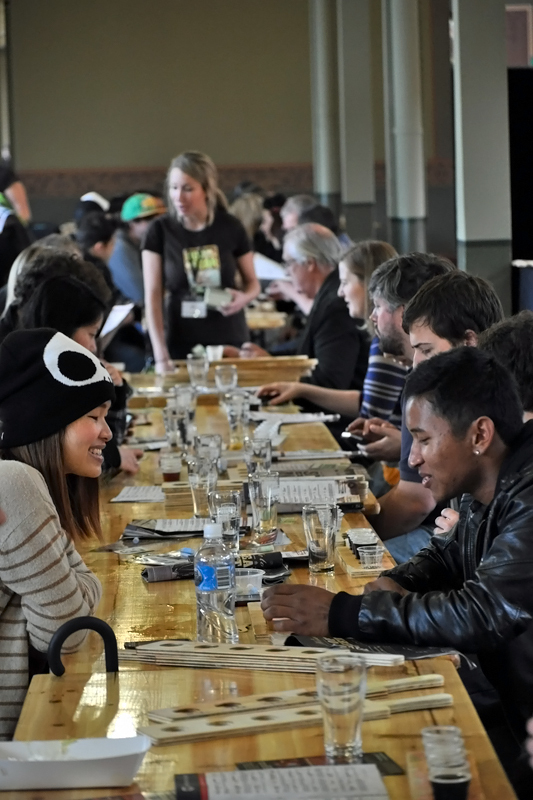 The broad appeal of the craft beer industry was evident in the diverse demographics attending GABS. Young and old, male and female, families and friends, experts and novices filled the Royal Exhibition Centre in seemingly even portions. Australian Brews News’ own Pete Mitcham observed that there was almost no indication of wives or female partners being dragged into and around a beer event by their husband or boyfriend. On the contrary, the opposite seemed to true at GABS, as women excitedly moved from bar to bar with male partners tailing, possibly in the role of designated drivers. Pete hosted 15 beer education sessions, as part of the Craft Beer College, which included brewer panel discussions, beer style focused seminars and beer tasting lessons. The most well-attended session was the beer and cheese tasting held on Sunday afternoon in conjunction with Calender Cheese Company. The 70 seat room squeezed in almost a hundred people who were keen to learn about the marriage of beer and cheese. 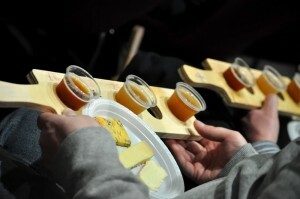 Pascal Tremblay of Calendar Cheese presented three contrasting cheeses to match with three of the GABS festival beers. A show of hands indicated that it wasn’t just the free beer or cheese that attracted people to the session, but rather an interest in discovering how the two worked together had brought them along. 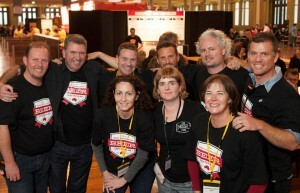 No doubt a second cheese session will be on the program at next year’s GABS. Guy Greenstone’s comments after the final bell summed up the logistics of GABS. The overwhelming highlight of this impressive festival is the way GABS furnishes a friendly and fun gathering over beer. The spacious and magnificent Royal Exhibition Centre interior, the always smiling and accessible volunteers, and the access to an array of beers, food and entertainment provides a unique and relaxed occasion for everyone. The challenge now is to keep the GABS festival true to its original design as a celebration for diverse and unique local beer, without succumbing to tan endeavour of continually outdoing itself. On this year’s performance, the organisers won’t need to change much in order to generate another excellent experience next year. I am glad the event went well but to not even mention the huge celebration that is Melbourne’s “Good Beer Week” is surprising to say the least… Just plain weird. Hi Jimbo. Whilst GABS happened at the same time as the Good Beer Week festival, it was not part of Good Beer Week. Without getting bogged down in the politics, Good Beer Week required registration and the payment of fees to be part of their festival and program. GABS was a separate event with a different organising committee. They both occur at the same time due to the cross over with the Australian International Beer Awards, which brings many brewers and industry people to Melbourne around those dates. 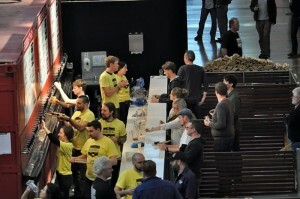 Brews News had media access to GABS, so the focus of this article was purely on the GABS event. Ok – apologies for not knowing the inside word. I just thought that ‘Good Beer Week’ was great celebration of craft beer across multiple venues which shared the joy around Melbourne town. But there is also an official framework around the Good Beer Week festival, which helps support the organisation and promotion of the events.